we are english was made by Sonia Boyce in collaboration with the Meriton School for Young Parents, Spike Island and Spike Print Studio. It was created during a residency at the Meriton School for Young Parents, Bristol in 2007. Emerging from several classroom discussions, she has begun to make a series of artworks that draw on these conversations, weaving together divergent narratives about contemporary urban life. 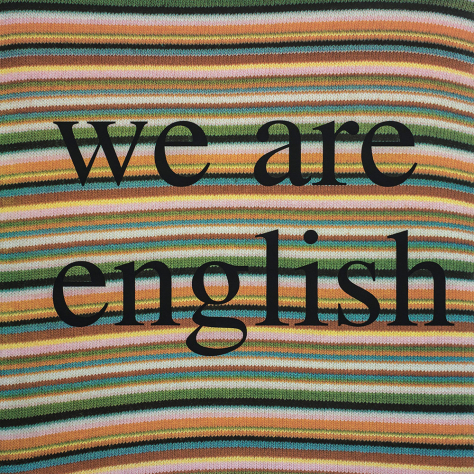 we are english, is the first discernible work to come out of this process of simply talking. It is a four-colour separation photo silk-screen print. Born in London (1962) of African-Caribbean descent, Sonia Boyce’s early pastel drawings and photographic collages address issues of race, ethnicity and contemporary urban experience, questioning racial stereotypes in the media and in day-to-day life. Most recently her work has shifted to incorporate a variety of media that combine photographs, collages, films, prints, drawings, installation and sound. Central to her practice is the question of working with other people in what she likes to call “improvised collaborations”, bringing the audience into sharper focus as an integral part of the creative process and demonstrating how cultural difference might be articulated, mediated and enjoyed.